Random House Trade Paperbacks, 9780812979367, 336pp. Introducing Detective Inspector Darko Dawson: dedicated family man, rebel in the office, ace in the field—and one of the most appealing sleuths to come along in years. 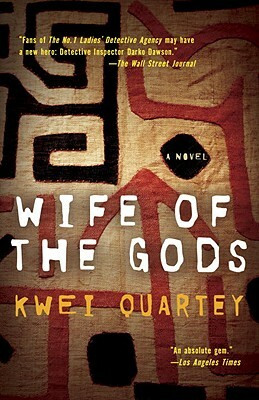 When we first meet Dawson, he’s been ordered by his cantankerous boss to leave behind his loving wife and young son in Ghana’s capital city to lead a murder investigation: In a shady grove outside the small town of Ketanu, a young woman—a promising medical student—has been found dead under suspicious circumstances. Dawson is fluent in Ketanu’s indigenous language, so he’s the right man for the job, but the local police are less than thrilled with an outsider’s interference. For Dawson, this sleepy corner of Ghana is rife with emotional land mines: an estranged relationship with the family he left behind twenty-five years earlier and the painful memory of his own mother’s inexplicable disappearance. Armed with remarkable insight and a healthy dose of skepticism, Dawson soon finds his cosmopolitan sensibilities clashing with age-old customs, including a disturbing practice in which teenage girls are offered to fetish priests as trokosi, or Wives of the Gods. Delving deeper into the student’s haunting death, Dawson will uncover long-buried secrets that, to his surprise, hit much too close to home. Kwei Quartey was raised in Ghana by an African American mother and a Ghanaian father, both of whom were university lecturers. Dr. Kwei Quartey practices medicine in Southern California, rising early in the morning to write before going to work. He is currently writing his next novel.